A high-speed railway viaduct experienced a sustained heave at high rates after its construction. The pillars of the bridge are founded on an Eocene hard anhydritic-gypsiferous claystone by means of massive foundations. Field investigations identified an active layer below the piles’ tips where expansions occur as a result of gypsum crystal growth in discontinuities from supersaturated aqueous solutions. The construction of the bridge is supposed to have triggered the swelling mechanism. An embankment, partially filling the valley, was built to slow the heave rate. The presence of soluble gypsum and anhydrite and inert materials is considered in the model developed to reproduce the observed expansive mechanism. The formulation describes the kinetics of dissolution and precipitation of minerals and the induced swelling strains by crystal growth. The calculated heave is compared with the field long-term vertical displacements measured before and after the construction of the embankment. A sensitivity study is also reported. 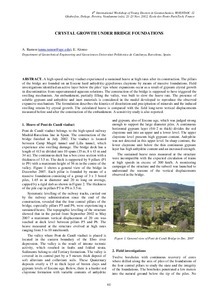 A high-speed railway viaduct experienced a sustained heave at high rates after its construction. The pillars of the bridge are founded on an Eocene hard anhydritic-gypsiferous claystone by means of massive foundations. Field investigations identified an active layer below the piles’ tips where expansions occur as a result of gypsum crystal growth in discontinuities from supersaturated aqueous solutions. The construction of the bridge is supposed to have triggered the swelling mechanism. An embankment, partially filling the valley, was built to slow the heave rate. The presence of soluble gypsum and anhydrite and inert materials is considered in the model developed to reproduce the observed expansive mechanism. The formulation describes the kinetics of dissolution and precipitation of minerals and the induced swelling strains by crystal growth. The calculated heave is compared with the field long-term vertical displacements measured before and after the construction of the embankment. A sensitivity study is also reported. W(H)YDOC PhD Prize 2012, durant el 4th International Workshop of Young Doctors in Geomechanics W(H)YDOC 2012. Ramon, A.; Alonso, E. Crystal growth under bridge foundation. A: International Workshop of Young Doctor in Geomechanics. "W(H)YDOC 12 : 4th International Workshop of Young Doctors in Geomechanics". Paris: 2012, p. 61-69.